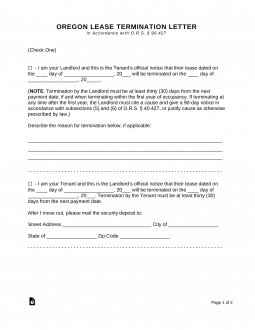 The Oregon Lease Termination Letter is a legal document that either a landlord or a tenant may use to offer notice to vacate a rental property one to the other. This is a simple document that once it’s been served places you in compliance with the law with regard to proper notice. Complete the document appropriately and either send it to the lessor or lessee or deliver it.